1997, Starring Jalal Merhi, Bolo Yeung, Cynthia Rothrock, Ong Soo Han, Evan Lurie. Directed by J. Stephen Maunder (FilmOne Productions). Talent, hard work and charisma be damned--if you want to be an instant movie star, the best way to launch your career is to bankroll your own series of genre films, each designed to portray you as an unbelievably suave kung fu master. Few have had as much success with this strategy as Jalal Merhi, the Toronto-based producer/star/occasional director behind FilmOne Productions, an ignominious company that has released a steady stream of Canadian-based chop socky B-flicks since the early 1990s. A sequel to one of his first, and most popular efforts, Tiger Claws II is a typically dismal Merhi outing, pairing the less-than-adequate fighting skills of its producer with recognizable talents Cynthia Rothrock and Bolo Yeung. Released five years after the first installment, Tiger Claws II finds Yeung's martial arts serial killer, Chong, busted out of jail by a team of heavies in the employ of gangster Dai Lo Fu (Ong Soo Han), and whisked across the country to San Francisco's Chinatown. When NYC cop Tarek Richards (Merhi) learns of a rash of recent killings using Chong's distinctive M.O. a claw-like mark across the face of the victim he contacts his old partner, Linda Masterson (Cynthia Rothrock), who is now living in L.A., for help. But Chong, as it turns out, has nothing to do with the murders. He's just being used by crime kingpin Lo Fu, who needs to combine his energy with Chong's to open some sort of time portal and, as he explains, provide vital supplies for the ancient Shaolin monks. In truth, though, Lo Fu greedily plans to use the portal to smuggle heavy modern artillery back and rule Qing Dynasty-era China himself. As Tarek and Linda rekindle their romance while staking out Lo Fu's Chinese eatery and headquarters, the bad guys are planning a martial arts competition with an extremely vague relationship to the plot. 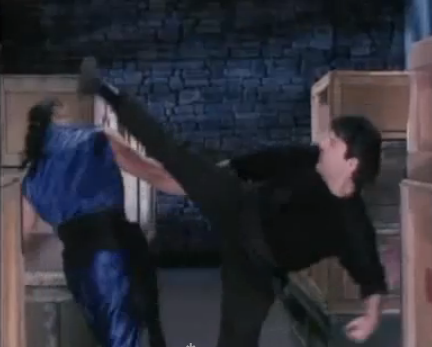 As with the other FilmOne productions, it seems mostly conceived as a way for Merhi to show off his debatable combat skills, which are conveniently given a showcase when he's promptly captured by Lo Fu's goons and forced to square off against Chong and a crew of heretofore unseen fighters. Meanwhile, Linda is thrown in a cell with Chong and Lo Fu's old master, Sifu Chow (Eric Lee), and, after a suitable amount of tournament footage, they escape to warn the apparently fully-reformed Chong about Lo Fu's evil plans. FilmOne's in-house screenwriter J. Stephen Maunder steps up to handle directing duties for the sequel, and he does an adequate job despite his inexperience behind the camera, providing some passable (but generally unexciting) fight footage and a few touches of atmosphere to the film's laughably low-budget sets. As with the first installment, it's his script that really needed more attention, though the ludicrous and needlessly convoluted story curiously exonerates Chong from his past murder spree, and reveals the cold-hearted kung fu killer to be something of a lovable buffoon, thanks to a few odd moments of comedy schtick. This questionable character change is made even more problematic by the fact that Yeung has only a rudimentary grasp of English. This wasn't an issue when he previously had to play a solemn and expressionless serial murderer, but the handful of lines he has in the script don't properly communicate this new, softer side of his personality. Likewise, the time traveling twist comes off as ill-conceived, and not only because Merhi simply doesn't have the budget to pull the needed special effects off. After its 1996 virtual reality flick Expect No Mercy, FilmOne's focus had changed from straight martial arts to science-fiction tinged action, so it's not wholly surprising that this sequel followed in the footsteps of its latest productions, but it simply doesn't jive with the grittier, reality-based world of cops 'n' crooks already established in the first film. And worst of all, it wasn't even necessary to include such a corny plot device, since it barely plays a part in the film (except for giving Maunder a conveniently sappy conclusion). Lo Fu could have simply busted Chong out of jail to join his arm of the Triad the precise reason is almost entirely inconsequential to the action. As usual, Merhi's insistence on casting himself as the main character sets up some strange dynamics within the film. Rothrock, who gets top billing on the DVD cover, is really no more than a capable sidekick and love interest for Merhi, who is clearly the main character despite being the weakest martial artist and an uncharismatic actor. His dull detective Tarek Richards is constantly having scenes stolen away by unimportant secondary characters. Aside from the physically impressive Yeung, Hollywood action bit-player Ong Soo Han is the only actor here who makes an impression. Tellingly, both Han and Yeung were nowhere to be found for 1999's Tiger Claws III: The Final Conflict, which reunited Merhi and Rothrock against Stryker (Loren Avedon), a fighter with the power to summon ancient ghosts. 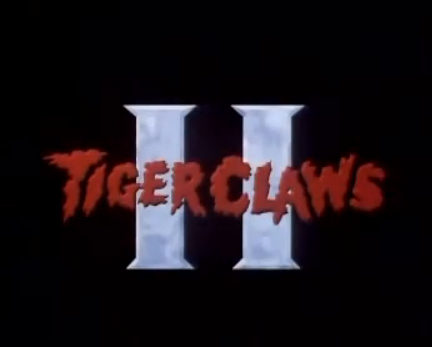 Tiger Claws II does distinguish itself from other the majority of other FilmOne productions through its setting, however. While many of Merhi's films do acknowledge their Canadian roots or try to disguise it with stock establishing shots, this time the action takes place in San Francisco and New York, with what appears to be some actual location shooting in both of those cities. Although the soundstage work does appear to be shot on Merhi's converted Donlands Theatre studio, Canadian viewers aren't given much to admire, as we are ferried from uninspired apartment bedroom sets to featureless warehouses and phony-looking Chinese restaurants. A weak entry even in FilmOne's derivative stable of action pics, watching Tiger Claws II is like getting hit in the face by one of Merhi's wishy-washy roundhouse kicks vaguely annoying and instantly forgettable.